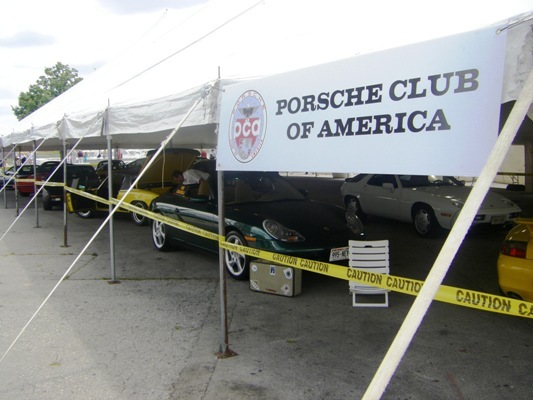 The Milwaukee Region is idling for just a few weeks before the 2010 season revs up -- a season that will mark our 50th year as a chartered region of the Porsche Club of America. We hope that every member can join us for at least one event this coming year - if not more. We'll have a variety of events from which to choose -- track time, tours, social, tech, car show, etc. In this issue of Steinlifters Online, you can read about the region's top autocrossers for the 2009 season, welcome members who have transferred to our region, salute those observing a December membership anniversary, read The Next Chapter, an article submitted by Ron Pace chronicling his experience applying what he learned at the fall tech session on repairing the paint on one of his cars and catch up on the latest from Porsche and other media reports about the cars we love. There's an interesting "audio" quiz in which you have to match the sound of various 911 engines to 911 models. Also check out -- a year-end message from Region President Don Kiepert and the region's year-in-review photo album at the bottom of this issue. Thanks to all of our Committee chairs and committee members for providing members with a variety of first-class events. Dec. 3 - Board meeting. 6:30 p.m. Brew City Grill, Mequon. All members are always welcome to pull up a chair, order a beverage (and food too if you haven't had dinner yet) and participate in the region's monthly meeting of the board. Feb. 6 - Historic Turbo Spaghetti. If you've been a member for a while, you've heard about Turbo Spaghetti and Carrera Chili, the region's annual gathering in the dead of winter to bring us together for food, camaraderie, conversation and friendly competition. The menu alternates between spaghetti and chili. This time it's spaghetti. Bring a batch of your family's favorite pasta sauce to enter in the competition or come without an entry and just enjoy. This will be the kick-off event to a year of celebrating Everything Porsche, the cars, the people and the experience of membership in the Porsche Club of America. Details here, including Feb. 1 RSVP requirements. April 30 -- Mark your calendar for an event to mark the 50th year of our region's charter. We'll be getting more details to all members about this event that will epitomize Everything Porsche. Region Secretary Ron Pace writes about his experience applying the tips he learned at the tech session about restoring the paint on his Porsche. Read The Next Chapter here. 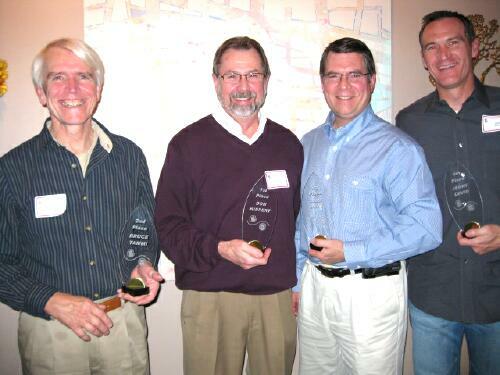 The top autocrossers in the Milwaukee Region received trophies at the Nov. 13 casual fish fry. Read about the winners here. If you're not into autocross, but would like to help out on autocross days, we would appreciate your willingness to step forward and give the region a couple of hours of your time. Training provided. Contact Autocross Chair Bruce Tammi via e-mail at bruce@brucetammi.com to learn more about what's needed to keep our region's autocross program running. Tim and Nancy Selby, transferred from Central Indiana Region. Tim and Nancy live in Sheboygan and drive a 1989 944. Guenter and Katharina Weber, transferred from Chicago Region. Guenter and Katharina live in Milwaukee and drive a 2001 Boxster. Classifieds. Check out the classifieds here. 911 GT3 R to make its debut for 2010 race schedule. 480 hp is all yours with this serious machine from Stuttgart. Read Car & Driver's take on the 911 GT3 R race car. Read Car & Driver's road test of the Cayman, complete with a photo album. Porsche approves winter tires for young and old classics. Audio quiz! Can you tell one 911 from another (a 993 from a 930 for example) just by the sound of the engine? Here's a quiz to test your knowledge. Contest closes at the end of January. Porsche offers lightweight battery for certain models. Available in February. October sales report from Porsche. November sales report from Porsche. Follow us on Facebook. Search for PCA Milwaukee on Facebook and follow us as a fan. We had a full agenda this year, with some months offering more than one option for involvement. Here's a snapshot of the activities that brought us together. 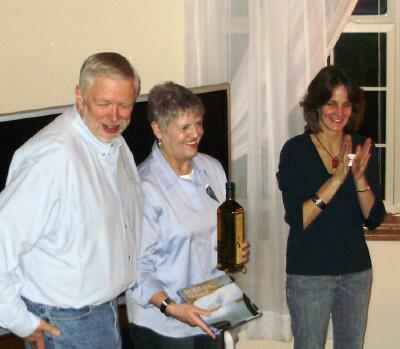 Carrera Chili in February 2009 -- Kim Zinda (right), presents the People's Choice award to Tom "Muck" Mucklin (left) and Sharon Mucklin (center). 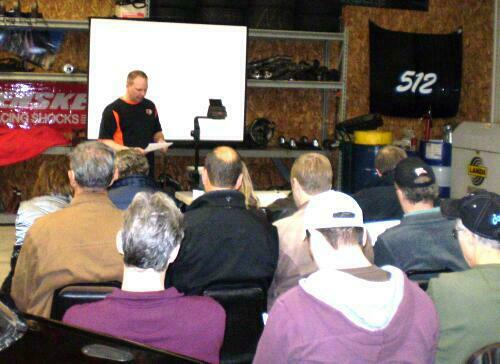 March tech session on the basics of Driver Education at CS Motorsports. Chris Schuh (above) and Ron Pace were the key presenters at this session. April -- Car show at the Zablocki Medical Center for the enjoyment of our military veterans. 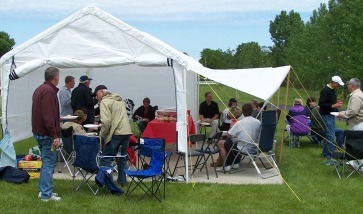 Despite the rain, our members came out in force, much to the enjoyment of the vets and staff at the VA.
May 2009 - Our annual Hallenbeck Drive Into Spring drivers education event at Road America. June 2009 -- We enjoyed a short drive in SE Wisconsin followed by a picnic in member David Sislowski's yard in Racine County. July 2009 - Milwaukee Region members display their cars at German Fest. 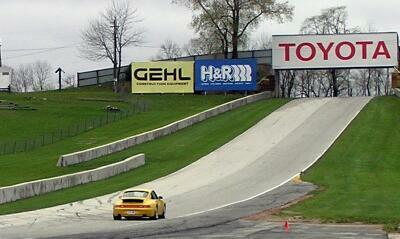 August 2009 -- Gary Haas puts his Cayman through its paces on the autocross course at Miller Park. 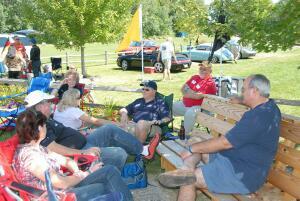 September 2009 - Milwaukee and Fox Valley Region members enjoyed a picnic at Porsche Park, Road America, during the Chicago Region's Labor Day weekend that included drivers education and a Club Race. October 2009 - Drive to breakfast. Tour leader Geoff Wilde (center) conducts the drivers meeting before region members and their Porsches tackled some interesting roads in Walworth County en route to Millie's Pancake House in Delavan. 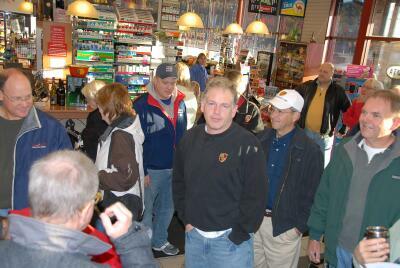 November 2009 -- The region's top autocrossers received their awards at the casual fish fry. From left to right, Bruce Tammi, Don Kiepert, Gary Haas and Jerry David.